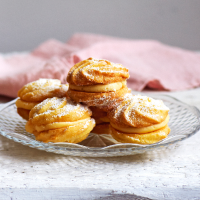 Sandwiched with a passion fruit buttercream, these biscuits live up to their name by melting in the mouth. 1. Preheat the oven to 180°C, gas mark 4. Halve each passion fruit and scoop the flesh into a sieve, pressing down with the back of a spoon to release the juice (you will need 41⁄2 tbsp in total). 2. For the biscuits, cream together the butter and icing sugar with electric beaters (or in a freestanding mixer) until pale. Sift in the flour and cornflour and add 21⁄2 tbsp passion fruit juice and 21⁄2 tbsp just-boiled water. Beat until the mixture comes together; scrape down if needed. 3. Attach a large star nozzle to a piping bag and fill the bag with the mixture. Pipe 28 x 5cm rosettes onto parchment-lined baking sheets, about 3cm apart. Bake for 20-25 minutes, or until pale golden. Cool for 5 minutes on the baking sheets, then cool fully on a wire rack. 4. Meanwhile, make the passion fruit buttercream by beating together the butter, icing sugar and remaining 2 tbsp passion fruit juice until pale and fluffy. Sandwich the biscuits together using a generous amount of buttercream and finish with a dusting of icing sugar.